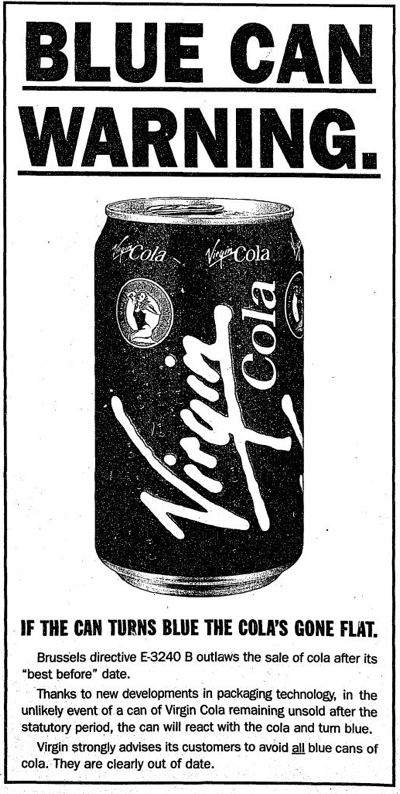 Virgin Cola announced that in the interest of consumer safety it had integrated a new technology into its cans. When the cola passed its sell-by date, the liquid would react with the metal in the can, turning the can bright blue. Virgin warned that consumers should therefore avoid purchasing all blue cans. Coincidentally, Pepsi had recently unveiled its newly designed cans which were bright blue.